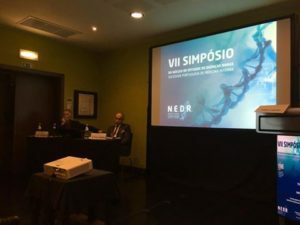 The 7th Symposium of the Rare Disease Research Centre (NEDR), organized by the Centre for the Study of Rare Diseases of the Portuguese Society of Internal Medicine (SPMI), was held at Hotel Villa Galé in Coimbra on 3 and 4 February this year. As in previous years, a number of topics that are scientifically new and others where there have been significant advances in both clinical and therapeutic aspects have been addressed. Several sessions were also held, such as on Aquaporins, Alkaptonuria, Dysautonomia and Thrombotic Microangiopathies. The speakers and moderators involved in the event were mainly internists and physicians from other specialties, such as Endocrinology and Dermatology, of recognized competence in the areas covered (some working at Hospital de Santa Maria-CHLN).